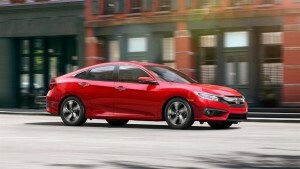 The Honda Civic has long been an industry staple and best-seller, and now it is an even better deal than ever at your car dealerships in Sanford, NC. Those of us who prefer leasing our cars can take advantage of leasing a 2016 Honda Civic Sedan CVT LX for just $179 per month for 39 months* from Sanford Honda now through February 29, 2016. Redesigned inside and out in recent years, the 2016 Honda Civic is a great fit for anyone from singles to couples and even small families. The new Civic models feature a nice uptick to its engines and efficiency, which means more savings for you with fewer trips to the fuel pump. Under the hood, the 2016 Honda Civic has never been more efficient with its fuel. The Civic Sedan CVT LX will net you 41 miles per gallon on the highway and 31 mpg in the city** to relieve pressure on your monthly budget. Checking in at an ample 143 horsepower, the 2016 Civic sports plenty of giddyup. Inside, the new Honda Civic improves cabin noise … and still comes loaded with plentiful standard tech features like Bluetooth wireless, a rearview camera, text message functionality, an iPod interface and Pandora functionality. You’ll notice that you feel quite safe in the new Honda Civic sedan, as well. That because your surrounded with award-winning safety features and technology that have earned a National Highway Traffic Safety Administration’s perfect score of five stars for safety. Got a small crew to move around? The new Civic boasts ample interior space of more than 94 cubic feet of passenger volume and room to fit 5 people with plenty of personal space left over. So, a 2016 Civic from Sanford Honda works perfectly for a small-to-medium sized family. Plenty of cargo space means that the 2016 Civic is a great companion for family vacations and road trips just as well as a run to the grocery store. What are you waiting for? Visit Sanford Honda in NC today and test drive a vehicle you can count on to provide everything from safety to efficiency and bountiful room.